RENDER4YOU offers you up to 1758 Ghz of render power with an estimated rating of 100000 CineBench R15 points. 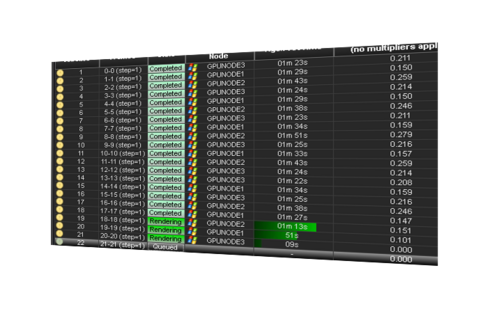 All render nodes are running Windows 7 Professional and 64GB-256GB of ram. Ongoing projects are stored locally on our in-house storages and will be automatically deleted 7 days after the project has been finished. We also provide GPU rendering for iray, iray+, vrayrt, redshift, blender, c4d and cycles and other GPU render applications. GPU Rendering with up to 261120 Cuda Cores for all major GPU Renderer, Cycles, IRAY, Octane. VRAY RT, Redshift3d, Furryball and more.